I would love having Clementine in my class at school. She is herself at all times. I admire that. She would be a great friend. She is creative and funny. Although I have to say she does some things that would make my 9-year old self a little nervous. (I didn’t like getting into trouble.) She is committed to her family and she always tried her best. It’s just that things don’t always work out smoothly. 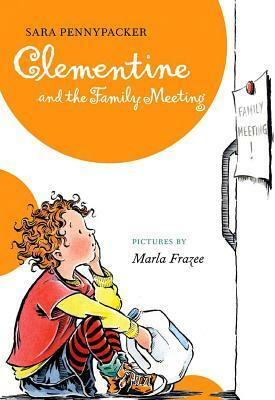 When this book begins Clementine’s having a nervous breakdown. The “Family Meeting!” sign is up in her house. She knows she must be in trouble for something, but she can’t figure out what it is. Try as she might to find out what’s on the agenda, her parents won’t give her even the smallest, teeniest clue before the meeting. Clementine gets through that meeting just fine, but in the end initiates a meeting of her own to let her family know how she would like to deal with the changes in their lives. In between she tries to work with Waylon to create a science project – he wants to try transmogrification – and with Margaret her year-older neighbor who is thinking makeup is the coolest thing. Clementine is not so sure. One of my favorite parts of the story is how Clementine (named after a fruit) always calls her little brother Squash or Yam or Bean Sprout throughout the books. It seems as though she might find him annoying, but really he turns out to be a pretty great kid to be a sister to. Read all the Clementine books. They’re fun and refreshing and real.